Pictured above is one of our recent installs in Oklahoma City, OK. 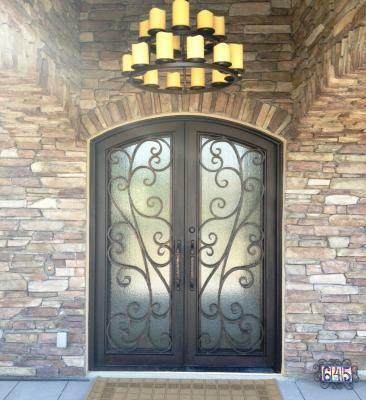 This custom iron entry door has hand forged scroll work making this piece truly beautiful while complimenting the stonework surrounding the door. Our iron doors have a one piece folded frame that is truly unique to the market. With this seamless look, you can have the confidense that this door will last for ages and maintain it's elegant clean look. As guests approach your home, this door will give a lasting first impression. To give your home a complete look, we can pair iron garage doors and ornamental wrought iron railing to match the scroll work and finish of your door. The team here at Signature Iron Doors is truly proud of our product quality and customer service and we invite you to to explore our website and contact us to find out how we can transform your home into a work of art.